The day before the race was a little surreal. I was up at the lake and Terry Davis brought a bunch of us past winners up on stage to honor our place in the history of the race. We each spoke briefly about our first experiences with the race and how it affected our careers after winning. It was the first time I’d been on stage in front of a group in such a long time, I was nervous. I rarely get nervous anymore, so that was actually fun. I wasn’t sure if my voice would crack or not when I first began to speak. I guess I’m not really sure if it did or not. I should ask someone, if anyone was paying attention. From the stage we were all escorted to a new set of stairs Terry had built from the lower parking lot (transition area) to the upper lot (finish area.) 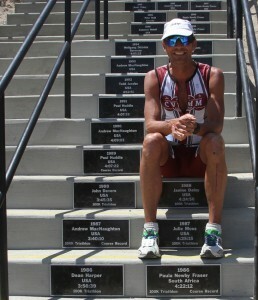 On the face or riser of each of the steps Terry put a couple of plaques, one for women and one for men, with the year, the name of the winner of the long course race, and their time. It was incredible. Nothing like this has happened before in triathlon, as far as I know, honoring past winners with permanent plaques to be seen year round by anyone going to the lake. It was a strange yet surprisingly good feeling. I don’t really think about my racing past much and it’s always surprising when someone remembers or even cares who I was. Next time I go there I’ll wear a name tags that reads – I used to be that guy on the steps 3 times. Thank you Terry for putting on a race that immediately captured my interest and kept it for so long. I made it a priority during my racing career and it continues to allow me to chase my younger self around Lake San Antonio’s roads and trails. I love the feel and energy there, and look forward to going back again and again. This entry was posted in Thoughts, Triathlon. Bookmark the permalink.